If there’s one thing that is an absolute essential for any kind of shooting sport, than it will be ballistic safety glasses. You only have one pair of eyes after all, and running around with an eyepatch doesn’t really add to your “tacticool” presence. 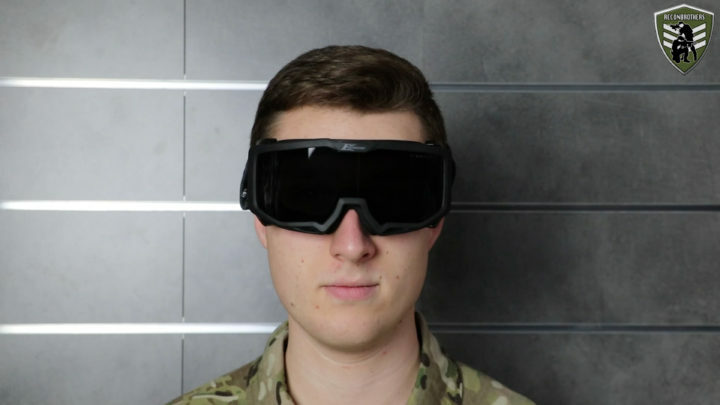 Before considering getting all those tactical weapon attachments and other cool stuff it is necessary to first get proper ballistic safety glasses. This means you don’t want to be close-handed and want to do serious research to protect your eyes. 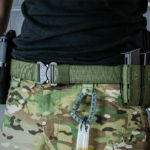 Especially for our airsoft brothers and sisters out there, this is even more important because doing our sport also means you’re getting shot at. 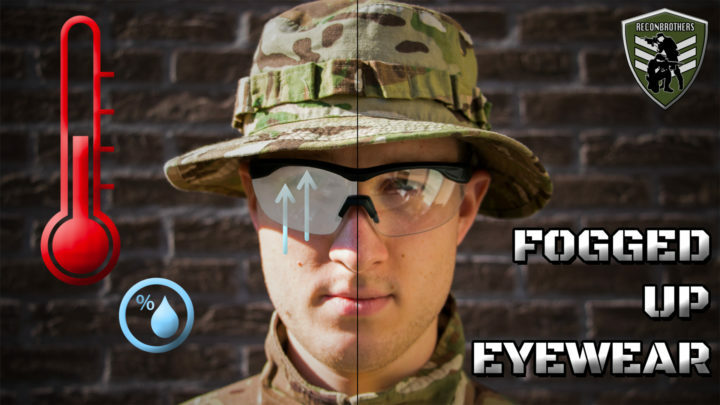 Ballistic safety glasses and goggles both have their advantages and disadvantages. The difference between the two is pretty straight forward. 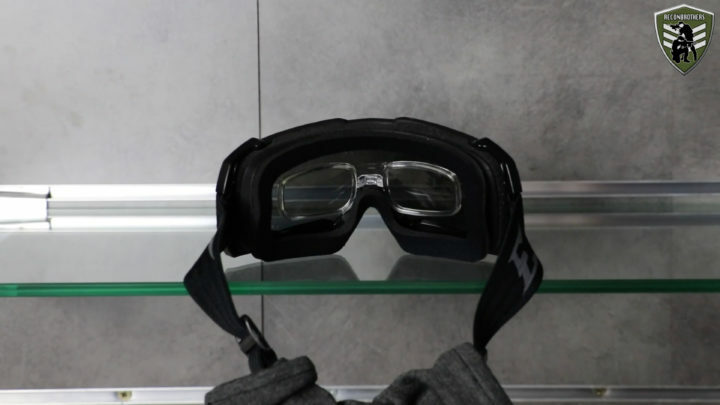 Goggles are fully sealed and provide a full 360° protection for your eyes against dirt, debris or projectiles that might come at you from the sides. Because of their high protection level, they are in general more heavier and bulkier in design. Glasses on the other hand don’t provide as much protection as goggles do, but are more lightweight and comfortable. 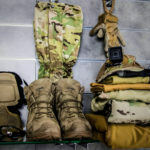 Remind yourself that comfort decides whether you are able to wear them for long periods of time in the field or on the range. Also mind that safety glasses do exist with wraparound designs to maximize protection from the sides when selecting your glasses. 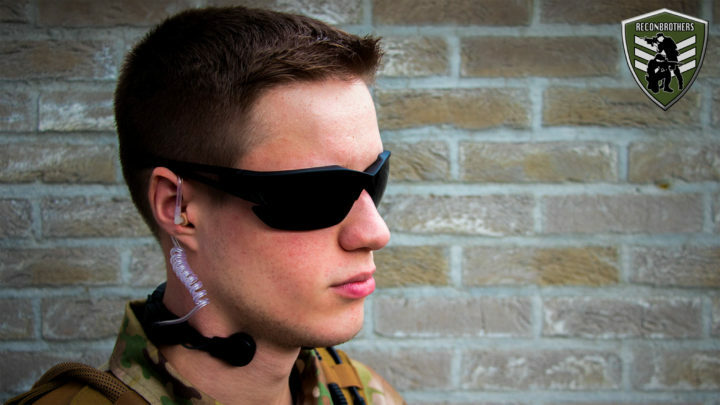 If you’re planning to wear your ballistic safety glasses together with ear pads or headsets, it is important to keep in mind that the frame of your eyewear is thin enough. This to provide a proper seal. 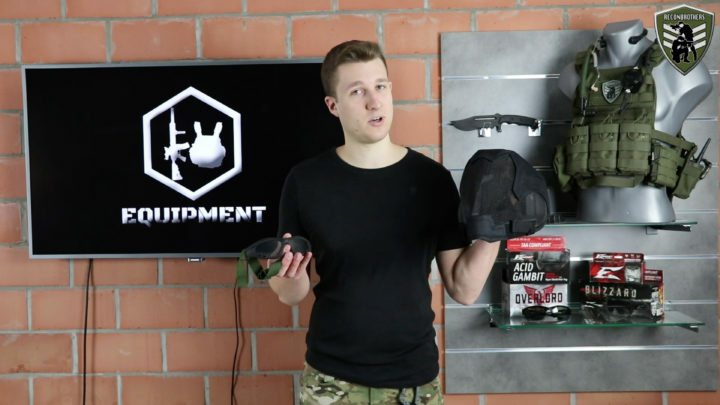 Another option is to buy ear pads with relief cuts. Also when choosing glasses, take in consideration that everybody’s face is different! This means that eyewear which is perfect for one of your friends doesn’t necessarily fits you as well. Doing so might cause uncomfortable pressure points on your face for example. To find your personal fit there are some rules of thumb to take in consideration. 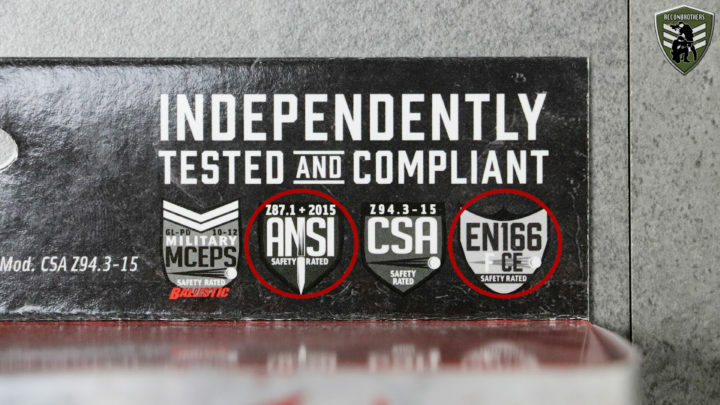 When looking for ballistic safety glasses you want to make sure it has AT LEAST 1 of the following 2 safety ratings called: “ANSI Z87” or “CE EN166”. These ratings indicate that the eyewear has gone through an official experimental procedure that verifies its safety according to the USA or EU standards. If the glasses don’t have such a rating it is not guaranteed that it offers the required level of safety. Especially when putting in physical effort, the chances for fogging glasses are high. Some products on the market provide solutions for this, like anti-fog coatings for example. Click to learn all about fogging eyewear and the different solutions available. 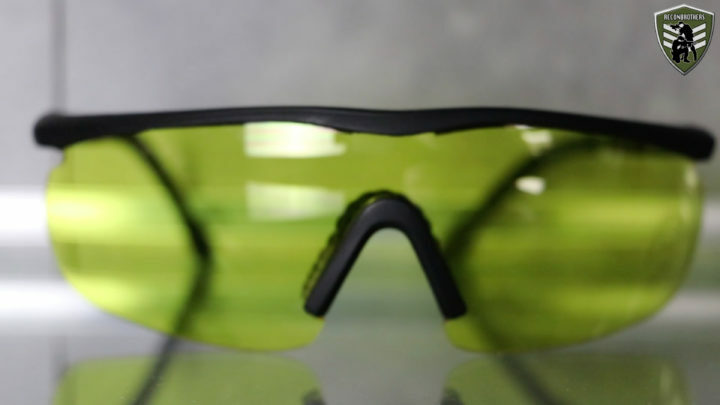 Most ballistic safety glasses are made from a polycarbonate material. This is ideal for both protection and visibility but polycarbonate has the disadvantage of getting scratched really quickly. And especially when not properly being taken care of. To deal with this, some eyewear is treated with an anti-scratch coating to protect it against a certain level of scratches. The choice of colored glasses is more of a personal preference. Nowadays protective lenses are available in almost all different colors you can imagine. They all serve a different purpose but the most common ones out there are the clear lenses, dark lenses and yellow lenses. Clear lenses can be worn anywhere anytime, while dark lenses reduce eye fatigue and yellow lenses improve visual clarity. Whatever color you choose, a more important thing to look out for is the protection against blue light and harmful UV-rays. All polycarbonate materials absorb UV-light and will decay over time when exposed to sunlight. This means that even though your eyewear seems fine after long time of usage, they may not provide the same level of protection as they used to do. A good rule of thumb is to replace lower quality glasses once every year while higher quality glasses only need replacement once every 2 to 3 years. If you use prescription lenses, we suggest to first take a look at contact lenses. If you don’t like to use contact lenses or if this is not an option for you, you can take a look at prescription lenses specially made for prescription adapters. These adapters fit in the nose bridge of safety glasses but can be expensive. 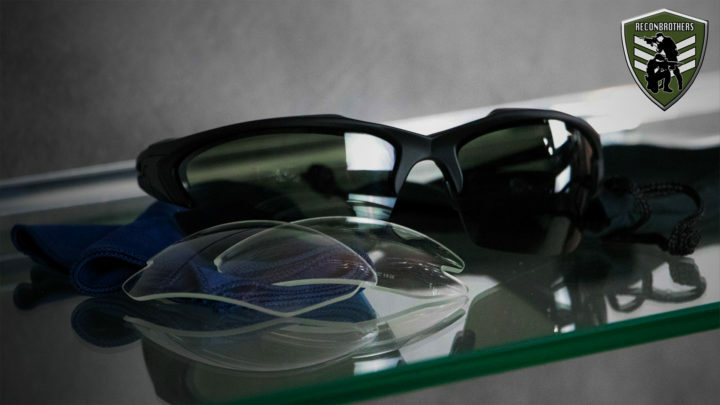 Eyewear made of mesh might sound as a good idea to some. Because what can go wrong if the holes are smaller than the projectiles, right?! First of all, yes, they have the advantage that they will never fog up. But there’s a big safety issue. Namely, when BBs hit mesh they have a chance to split in pieces (especially the bad quality ones) which means that fragments of the BB can split in pieces, hit the eye and inflict damage. Due to this reason, some countries don’t even allow the use of mesh eyewear. So, the use of these is ABSOLUTY NOT RECOMMENDED!!! Another indication of these not being safe is that you never find mesh eyewear with a legit impact resistance rating. 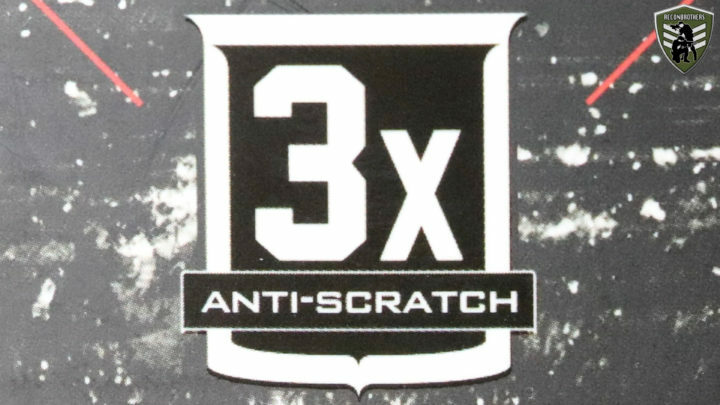 The origins of these lays in the paintball industry. These are ideal to provide a full-face protection. 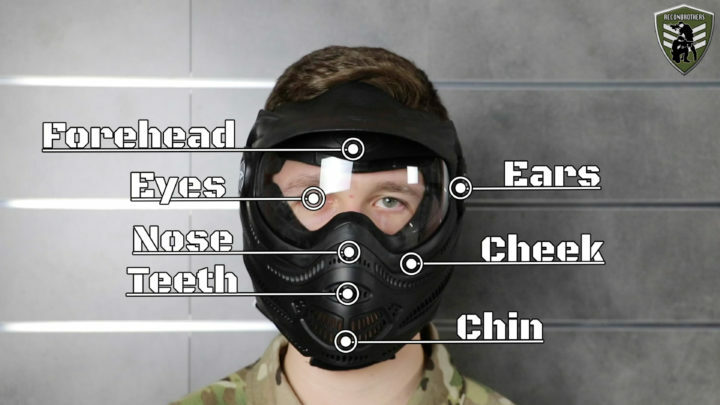 So, above the eyes, they also protect your nose, teeth, forehead, ears, etc. Also, these have a chance to fog up but one of the biggest disadvantages is that they don’t allow a proper sight alignment as well as muffle your voice. These are both due to their bulky design. 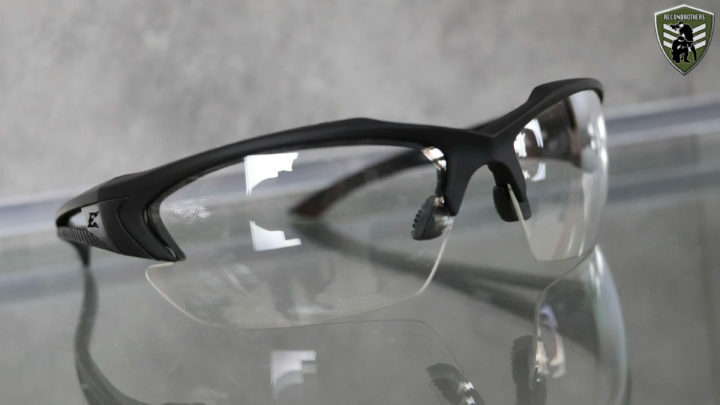 We hope this guide on Choosing The Best Ballistic Safety Glasses for Shooting gives you a better idea on what to look for in your safety glasses selection process. Got some buddies looking for new glasses? SHARE this blog to give them a better idea for their selection.